Leaders of the ultra-Orthodox Belz sect in north London wrote to parents saying "no child will be allowed to learn in our school" if their mother drives. Women driving "goes against the laws of modesty within our society", it said. A spokesman from the Belz Community said they were "saddened" by the "misrepresentation" of the notice. The Home Office said it would be inappropriate to comment on individual cases, adding that the government "believes everyone in this country is equal and everybody is free to lead their lives as they see fit". The Belz, who originated in Ukraine in the early 19th Century, are an ultra-Orthodox sect who follow Haredi Judaism. The letter, which was signed from the "spiritual management" of Belz institutions, said: "There has been an increase in incidences of mothers of our students who have begun driving cars, something that goes against the laws of modesty within our society." This had led to "a lot of exasperation among other parents", it said. The group's leader in Israel, Rabbi Yissachar Dov Rokeach, had advised that "if a woman is driving a car, she cannot send her children to be educated in Belz institutions", it said. It added that women with a "specific reason" to drive could submit a request to a special committee. The Belz community are part of the Haredi community - ultra-orthodox Jews for whom religion is a defining part of their identity. Although historically a small part of the overall Jewish population in Britain, the Haredi are growing, mostly because of their high birth rate. 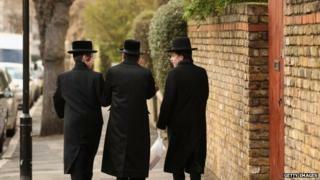 They are already the dominant group among Jewish communities in Hackney, Haringey, Salford, and Gateshead, and the Institute of Jewish Policy Research (IJPR) says that Haredi numbers will double in size every eighteen years. An emphasis on studying the Torah has led to concerns that Haredi boys are leaving school with few qualifications. Men often continue with their prayer studies after marriage, rather than seek work, and those who do have employment have been affected by changes in traditional occupations, like textiles. As a result, poverty and deprivation tend to hit Haredi households hard, and there's evidence that Haredi areas in Hackney, for example, receive higher than average rates of means-tested benefits. The IJPR though, says that the insular nature of Haredi life also produces a highly-supportive community, whose members work hard to help each other. The Jewish Chronicle, which first reported the story, said that while many Hasidic women do not drive, this is thought to be the first formal declaration against the practice in the UK. Dina Brawer, UK Ambassador of the Jewish Orthodox Feminist Alliance, said the rule was "stupid and impractical" and could not work. Responding to the letter, Education Secretary and Minister for Women and Equalities, Nicky Morgan, said: "This is completely unacceptable in modern Britain. "If schools do not actively promote the principle of respect for other people they are breaching the independent school standards. "Where we are made aware of such breaches we will investigate and take any necessary action to address the situation." But in a statement to Mrs Morgan from the Belz community, a spokesman said it never intended to "stigmatise or discriminate against children or their parents". It said: "We are proud of what we stand for and we do not feel the need to excuse ourselves for our deeply held beliefs and staunchly maintained way of life. "It has withstood the test of time and is not prone to the vagaries of passing fads." The statement continued: "In an effort to formulate these guidelines the issue of women driving cars became conflated with broader issues which we intended to address. "It is a fact that most women in our community do not drive cars. It is equally true that a fair number of women do drive cars openly and entirely unhindered. "They and their families are as respected within our community as any other members and we have no intention of changing that." This goes to the heart of what is a fantastically difficult problem now facing the government in drafting a counter-extremism bill that protects against extremism, but also safeguards religious freedom. Earlier this year, Home Secretary Theresa May defined extremism as "the vocal or active opposition to fundamental British values, including democracy, the rule of law, individual liberty and the mutual respect and tolerance of different faiths and beliefs". It throws up the question, is a religious ban on women driving active opposition to the British value of individual liberty? And how do you square that with the other British value of mutual respect and tolerance for different faiths and beliefs? Be assured that there will be some very big legal brains at the Home Office grappling with this issue right now, trying to define extremism in a way that is workable and effective. But if such issues as religious driving bans are to be covered by the extremism bill, those responsible could be subject to a banning order which could ban an entire organisation, or a disruption order that aims to curtail the acts of an individual. These could be civil orders - like the Asbo-type orders that we're familiar with, which ban people from a particular activity - but breaching them is a criminal offence which can carry a significant custodial sentence. A spokesman for the Office of the Chief Rabbi in the UK said: "The Belz Chasidic dynasty has contributed significantly to the rich tapestry of our tradition but this particular view is entirely removed from mainstream Jewish practice." Labour said its shadow women and equalities minister, Gloria De Piero, had written to the Equalities and Human Rights Commission asking them to investigate the lawfulness of the driving ban.